I’ve had my Motion 10 Speakers for only a week, but I think I’ve had enough time to give a very solid and honest review. They are good speakers, but are they great speakers? Before I answer that question, a couple of qualifiers need to be put into place: One, there is always something much better if you’re willing to pay a few hundred (or few thousand) extra dollars. Two: Music and the way it sounds to our ears is a bit of a personal preference, would’t you agree? But, let’s get to the basics: Why did I buy them in the first place and what brand did they replace? My last stereo speaker purchase was a pair of floor-standing, Wharfedale Emerald Series units from about 10-12 years ago. I bought these speakers because I got them for $119.00 for the pair ($238.00 with shipping) – and the online reviews on them were very impressive. I was not at all disappointed with my Wharfedale Emerald speakers, but unfortunately they began exhibiting some problems with the woofer. Intermittently, I was hearing lots of air and crackling when I should have been hearing bass. That means a blown speaker. This was unfortunate, because the Wharfedale had great sound for the price I paid. As many of the reviews stated – these $239.00 speakers sounded like $1,000 speakers. I particularly loved the great mid-range and well-balanced sound they produced. I listen to a wide variety of music from Pop to Classical to Jazz, Soul, Alternative Rock, Vocals and Rhythm and blues. The Wharfedale served me well, but unfortunately did not last as long as I would have hoped. Needless to say, for the $239.00 I paid, I was not about to worry about getting them fixed. There must be some other, bargain-based speakers out there that are just as good for the same price, right? Then, I got the email from New Egg and the opportunity for this Motion 10 Review. The Motion 10 only cost me $119.00 each. $238.00 for the pair. I had no idea who even made Motion 10, let alone whether or not they were any good. I decided to look them up. Motion 10’s are made by Martin Logan; an American Speaker company. The number of positive reviews on these speakers was truly impressive. Literally hundreds of Motion 10 users rated these speakers as excellent – the final Motion 10 review when you average out all of the opinions and ratings on Amazon is 4 stars. But, that 4-star rating is based on a price that is closer to $800 a pair – not the $238.00 that I ended up paying. At $238.00, the Motion 10’s are a bargain. Martin Logan, like all speaker companies, recommends getting a good 60-70 hours of playing time in before truly getting the best sound. Right out of the box, I loved the style and design of these speakers. As floor-standing speakers go, they are very small and compact. They weigh about 26lbs each and their height reaches up to about my hip. I’m 5’9″ tall. The speaker grills are awesome. They easily attach via magnetics. They also come with a cloth cover, which hopefully will keep our cat from doing too much damage to the grill. The Motion 10’s are handsome speakers and don’t look bulky in my den. But how do they sound as impressive as the Amazon Motion 10 review? How well do they Sound? For starters, I took out my MJO CD and put it into my DVD player. I was anxious to hear the full sound of these babies and tThe Metropolitan Jazz Orchestra is a 17-piece, big jazz band. I was concerned with how a big band would sound on such a smaller footprint, speaker. I was immediately satisfied by the full, rich mid-range which seemed equal if not better to the larger, bulkier Wharfedale. The Motion 10 however really punish the Wharfedale when it comes to tweeter or high tones. The Motion 10 sound is much crisper; with much better imaging and well placed sounds in the upper range. The tone on the higher pitches is far richer and easier to hear and enjoy than the Wharfedale’s. I think the tweeters which are uniquely designed and manufactured are the high point of the speakers. The smaller woofers or (subwoofers on these Motion 10s) are a weakness according to some reviews. While the Motion 10’s might not deliver that big, fat punchy, vibrating, air-producing bass of some of the larger, more expensive speakers, they are quite good for most genres of music. The bass you do hear form them is tight, well-defined and easy to hear and place. The Motion 10 seems to get better when I turn up the volume. I am amazed at the imaging and quality of sound coming from this pair of $239.00 speakers. I believe they are worth the original retail, asking price of $800-$1,000 for the pair. Motion 10 have been discontinued and replaced with Motion 20 speakers which are several times more expensive. This is what I love about shopping for and buying discontinued products. You never know what you’re going to get next and how good it’s going to be. I think some of the overly positive reviews on the Motion 10’s are exaggerated, but I also think some of the negatives are inaccurate and biased as well. Overall, the Motion 10 is a good set of speakers – especially for the price they are going for today. If you can grab a pair of Martin Logan Motion 10 Speakers today for under $300.00, your ears will be pleasantly pleased as were mine. Okay, so I’ve had some time to really play and review these speakers at various volumes and become more familiar with them. I’m still happy with the $238.00 total purchase, but I must say I am becoming increasingly disappointed in the sound quality, overall. These speakers do not produce rich, full sounding mid-range tones, particularly with full orchestra’s and big-jazz band instrumentation. I think the mid tones sound flat and scratchy. I somewhat agree with those who say the Motion 10’s are better at louder volumes. The bass and highs certainly sound better, but the mid-range just gets louder and lacks any real, authentic tonal quality. Recently, I played some big-band jazz by the Metropolitan Jazz Orchestra and Michael Buble. As a trumpet player, I really listen for the brass – and the brass as a section in these big bands just gets a little too messy to enjoy fully as you would at a concert or with an excellent pair of speakers. I can only define the trumpet section as sounding scratching, instead of full, brassy and rich as you would expect from – well, a brass section. The Motion 10 speakers are an excellent buy if you can get them for under $300.00. Please don’t buy them thinking that they are going to replace your craving for a high-end pair of really great sounding, speakers for your favorite music, particularly if you enjoy full orchestras and jazz bands. I really enjoyed listening to my speakers today. I listened to a variety of music from symphonic to big-band jazz, to pop vocals and I must say – it all sounded very good. In fact the Motion 10 speakers were rather impressive. When you consider I bought the pair for just $238.00 shipped, the Motion 10’s are a remarkable bargain and value. There might be a couple of reasons for why these speakers are sounding better to me today than they did a couple of days ago on my last update: For one thing, like most speakers, Motion 10 says they need a good 60 – 70 hour break-in period before they truly provide your ears with the best capable sound. Secondly, I did something that may have drastically caused some problems in the beginning. I decided to bi-wire the speakers. In other words, I connected a second pair of speaker wires to the B Speaker Inputs on my receiver and merged them together with the A Inputs. Today, I removed the B-Speaker inputs and have them connected only to the A. Perhaps it is my imagination, but things sounded much better today. I’m feeling pretty good about these speakers. The vocals on the Lucy Schwartz, Life-in-Letters Album sounded so good it was as if she was in my living room singing and playing the acoustic piano 10 feet from me. If you haven’t listened to Lucy Schwartz, by the way, I highly recommend her, regardless of what type of music you enjoy. Her breathy, live voice is a thing of beauty and her music, though rather pop and commercial sounds fresh and new. The song, You Are You Are, is absolutely breathtaking and I have to admit, the Motion-10 Speakers make it sound better to me than it ever has in the past. I’ll write more about the Motion-10’s as I hear more. Check back soon! I’m beginning to love these motion 10 speakers more every time I play a different style of CD on them. I recently heard my son playing a classical guitar CD I bought him for Christmas. This CD has an enormous amount of beautiful sounds to hear – all centered around a very beautifully played acoustic guitar. The tonal quality of the acoustic guitar coupled with the lush strings; deep base provides an enormous scope of range from low, mid to high. The Motion 10 speakers lend your ears to a real treat with this CD, giving you a true appreciation for how versatile they are. The solo guitar sounds tremendous. I cranked the Motion 10’s way up. When things on the CD got really busy with the full breadth of the orchestra at high volume, I kept expecting some of the tonal quality to get muddy, rattle or get lost somewhere before the song finished. The Motion 10’s did a beautiful job of rendering the full sounds of the orchestra. In case you’re interested in this full, rich and lush sounding music, the name of the CD is Guitar Classics: Andres Segovia – Bach Recital – John Williams – Bach Suite No. 1 & Bach Suite. No. 3. I listened to Diana Krall CD with big band, Clayton/Hamilton Jazz orchestra this evening. I gotta tell ya – these speakers keep getting better. I’m getting more and more impressed with how well the Motion-10’s separate and place the music inside the room. It sounded as though Diana Krall was in front of my den with the instruments behind, and on both sides of her. The saxophones are rich and woody and the brass, crisp and tight. Great sounds were coming out of this CD. Then, I took out an old Stan Kenton Album, Journey to Capricorn. I wasn’t expecting much because this CD was recorded 35 years ago. Again, I was pleasantly surprised. The brassy, Kenton sound with the high trumpets, and low, rich trombones were unmistakably clear and full. These speakers are getting better. Maybe, just maybe I’m getting close to that 60-70 hour burn-in period. A Candy Floss Machine makes a great gift idea for the holiday season or any other time of year, for that matter. Who doesn’t like Cotton Candy? Actually, I’ve never been crazy about it, but I do appreciate the fascination in a fluffy ball of cotton made from practically nothing but sugar and air. Having your own. This machine gives you that carnival atmosphere right in your very own home. 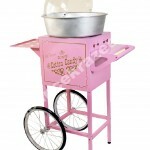 The Cotton Candy Machines below come in a variety of sizes, prices and levels of quality. If you’re wondering why you might pay $300 or more for a Cotton Candy maker when you’ve seen them for $100 or less, there are basically three reasons: Speed, Quality and Size. I used to own one of the cheaper machines and here’s what I’ve learned: They work, but it takes lots of time and effort to make anything that resembles the big, magical, fluffy ball of cotton that took you by surprise as a kid at your first circus show. I would literally spend 15 minutes or more with our old cheap floss machine to get something about 1/5th the size of the real thing. A real Cotton Candy Maker gets hot very quickly and due to it’s size produces a real cone of Candy Floss in just a matter of seconds. One day I was visiting a friends house when he took me down to his basement and said, “look at this”, He turned on the switch to a stainless steel-looking kettle, put in some powdered ingredients, and twirled it around with a cone. Seconds later, he presented me with a full fledged Cotton Candy treat. I knew then that this machine he had was a real Candy Floss Maker. You can find these machines from $250 – $750 that will do the job for you. The key to making it right is heat – fast heat and lots of it. These professional level machines need to have at least 800 watts. Below, you will find Cotton Candy Makers that will do the job. You will get what you pay for. Cotton Candy is basically sugar with either pink or blue-colored dye. Of course, sugar is not a very healthy snack, but one thing to remember: What you see in Cotton Candy is mostly air. The sugar used to make it does not even equal half of what’s in a can of Coke or Pepsi. An entire serving of Cotton Candy is only about 105 calories. Don’t worry about enjoying Candy Floss from time to time. Also, please tell us your brand and leave feedback in the comments section on bottom of page. To be scared, you’ve gotta really sense a character’s life is in danger. Having a little boy run from the fat bully at school playground simply won’t cut it. There is simply no other way around life-threatening suspense, like a real bad guy hiding in the basement with an axe or a glaze-eyed Jack Nicholson running down a hallway chasing a couple of frantic children. Most, if not all of the top 10, have danger in them. A scientist puts a dead man’s body back together and brings him back to life as a monster. Or a boy tells his mother he sees dead people. That’s pretty eerie and awfully creepy. Not all of the top 10 scariest movies ever are necessarily creepy, but they sure can be. The less believable it is, the less likely you are to buy into the fear. A titanic-sized dinosaur running down the street terrorizing the neighborhood might be exciting, but it’s not exactly going to keep you awake at night worrying. Seeing a possessed teenage girl turn her neck around 360 degrees, however, might give you cause to look around your room at night – if not, several weeks. Most all of the really scary moves have some form of believability about them. This may be the most important element of fear. It is the fear of the unknown, or a world that appears in a way that is different than the way we know or understand it. Ghosts, demons, the afterlife, or anything that we don’t expect to see every day – or want to see. As you will see, not all of the most scary movies have to be supernatural. See any of the horror scenes from Jaws. Or imagine a scene like in Sixth Sense where the dead boy says, “Come on, I’ll show you where my father keeps his gun.” Gore is what makes us remember what might happen. But, not all of scariest movies have gore. Nothing delivers a jolt to the nerves quite like a dead body falling out of your closet. Remember the scene in Jaws where they discover the dead man with the bulging eyes while diving in the water? Why do dead people always have to have bulging eyes? 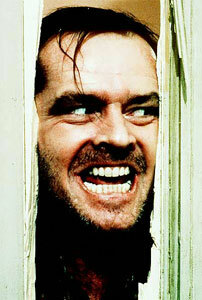 Most all of the scariest movies have some element of surprise in them. The twist can be a surprise like in The Sixth Sense or The Others. Or it can be something very disturbing. Try The Fog, or any Stephen King story. Most of the top 10 scariest movies ever have a twist or ironic element to them that makes them memorable. I believe I’ve covered the essential criteria of the top 10 scariest movies ever. Some scary movies may incorporate only a few of these criteria, but the really best ones have all the bases covered. You know how I love charts and ratings, so Product Review Ratings (PRR) has broken down the Top 10 Scariest Movies Ever based on the criteria above. Also, I’ve added the IMDB (International Movie Data Base)Movie Watchers Rating just to provide some perspective on the way viewers rated these horror flicks. I hope you enjoy the chart and please leave your own comments and feedback on your own Top-10 Really Scary Movies.